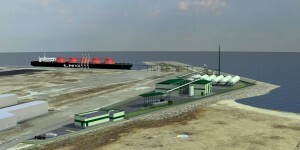 The aim of the project is to establish the LNG storage, truck loading, Security of Supply and bunkering terminal at Muuga harbour with an initial LNG storage capacity of 4000 m³, truck loading rack and up to 0.5 BCM per year connection to the natural gas grid through a connection point located about 1 km from the terminal plot. The terminal will be connected to an existing berth (depth -11 m, LOA 198 m). 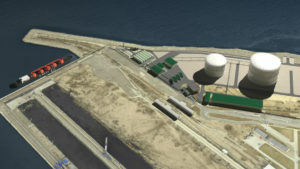 There is the possibility to expand the terminal into an on-land break bulk facility that can service any ship on the market by constructing up to four vertical LNG storage tanks with a storage capacity from 50 000 m3 to 250 000 m3, connecting to a second berth (depth -17 m, LOA 365 m) and expanding the natural gas grid connection up to 4 BCM per year through connection into the high pressure grid located about 13 km from the terminal plot. 02.05.2012. Tallinn Port Ltd, Vopak LNG Holdings B.V. (with Vopak affiliated company Vopak E.O.S. Ltd.) signed the Letter of Intent to develop LNG terminal at Muuga harbour. 12.09.2012. Tallinn LNG terminal pre-feasibility study was completed (Ramboll, Ref. No. 120531003). 30.08.2012. Tallinn LNG terminal spatial planning and environmental impact assessment (EIA) procedure was initiated in Jõelähtme municipality, Harjumaa, Estonia. 12.10.2012. Terminal technical Pre-Study completed by Vopak LNG. 25.05.2013. Feasibility study and cost-benefit analyses of liquefied natural gas (LNG) bunkering infastructure construction in the harbours of the Port of Tallinn was completed (Pöyry, Ref. No. 52X174558). 2013. The project was included in the European Union Projects of Common Interest (PCI) in Baltic Energy Market Interconnection Plan (BEMIP) priority corridor project no 8.1.2.3 (Regulation (EU) No 347/2013). The project’s PCI status was reaffirmed under the same number in 2015 PCI list. 11.10.2014. Initial technical conditions to connect Tallinn LNG terminal to the national gas grid were issued by EG Võrguteenus. 24.11.2014. Public discussion of planning scope and environmental impact assessment EIA programme in Jõelähtme municipality. The planning scope and EIA program was approved in 2014. Estimated completion of the planning procedure and environmental impact assessment is 3rd quater 2016. 12.2015. Principal technical design for 4000 cbm LNG storage liquefied natural gas (LNG) bunkering infastructure with truck loading and connection to the distribution grid is complete (Sweco Project work no 15320-0025). 03.2016. Preliminary environmental assessment and risk analysis for bunkering infrastructure completed. 12.2016. Terminal location (spatial) planning completed, planning is adopted by Jõelähtme municipal council.